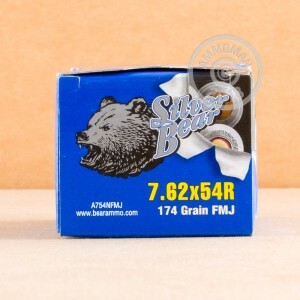 Silver Bear ammunition is a great way to get you shooting out on the range without breaking the bank. 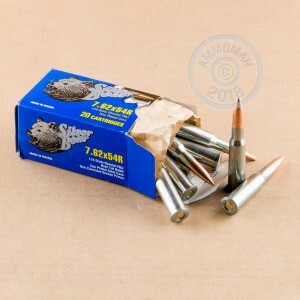 These new production 7.62x54R rounds are loaded into polished zinc-plated steel cases that come berdan primed and are not re-loadable. Each projectile in this box of 20 is a 174 grain bi-metal FMJ that is magnetic and leaves the barrel around 2,559 feet per second. These zinc-plated cases are usually reserved for law enforcement and specialty applications. Silver Bear is a trademark owned by DKG Trading Inc. They specialize in, "Scouring the world to find great values for the American shooter." DKG is a major importer of several different brand names of ammunition including the Bear family, American Cowboy, NobleSport and others. 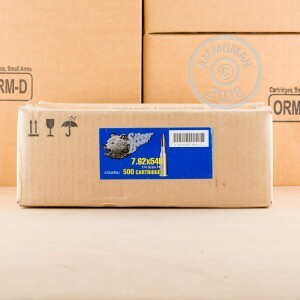 Most of the ammo under the "Bear" name is manufactured in the Tula Cartridge Works facility located in Russia. Do you need to re-supply your stockpile? At AmmoMan.com all orders over $99 receive Free Shipping!